The 1604 Charter required the provision of a Common Seal to validate the official documents issued from the Council. It took the form of a silver roundel deeply inscribed with a Portcullis, having three crossbars and embellished with chains fastened by rings to the upper corners of the frame. The seal, attached to an ivory handle, would be used to make an impression on a wax disc affixed to a document. The Shield of the Arms is decorated with a Portcullis and Chains in Gold with Points coloured Blue. The Crest on a Red and Gold Wreath is an Old Ship with one Mast, the Hull and Rudder in Gold with Towers fore and aft and at the Masthead in Silver. The Sail is furled with a swallow tailed Pennon flying from the mast head in Red. In 1943, when the country was deeply engaged in war and Harwich was in the front line of hostilities, time was, nevertheless, found for a revision in the design of the Coat of Arms. Letters Patent from the College of Heralds dated December 15th 1943, granted to the Borough, at the request of the Mayor, Councillor Blaxland Appleton, a new insignia. On the new Coat of Arms, separating the Shield from the Crest was a Silver Helmet, wreathed in Red and Gold. The portcullis had also acquired a fourth crossbar. Perhaps the helmet was meant to symbolise the wartime role of Harwich as being in vanguard of the country’s defence. 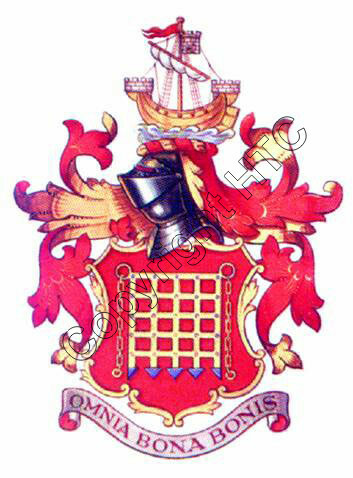 In 1974, when Harwich ceased to be a borough, the Arms and Crest were transferred to the Town Council of Harwich. A transaction approved and recorded by the College of Arms in London. The Seal currently used to validate official documents still uses the emblem of the Portcullis, or Watergate as it is sometimes described, so there is an unbroken continuity from 1604 to the present day.